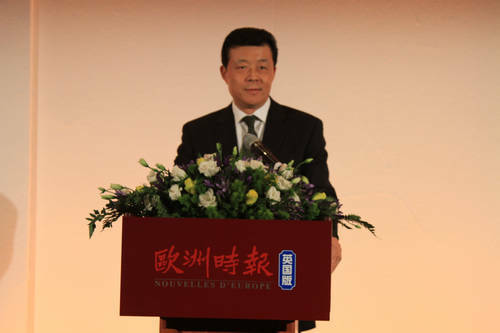 On December 15, Ambassador Liu Xiaoming attended the celebration for the launch of the Nouvelles D’Europe UK Edition at the Royal Garden Hotel London. Ms. Guo Jinling, Director for Culture and Education at China Overseas Exchange Association, Lord Nathanael Ming-Yan Wei, Member of the House of Lords and over 100 representatives from the Chinese community, Chinese-funded institutions and the media in the UK attended the event. Ambassador Liu first extended warm congratulations on the launch of the Nouvelles D’Europe UK Edition on behalf of the Chinese Embassy. He spoke highly of the achievements of the Nouvelles D’Europe over the nearly 30 years since its founding. He pointed out that in the context of the fast development of international media, the launch of the UK Edition not only marked a stronger influence of the newspaper but would also further strengthen the Chinese media in the UK and in Europe. Ambassador sent three wishes to the Nouvelles D’Europe UK Edition. The first is to strongly focus on serving the Chinese community in the UK. The Ambassador hoped that the UK edition would meet the diverse information needs of the Chinese community in the UK with a broad horizon and full coverage, would consolidate the overseas Chinese, pool their talents and serve their community, would become a guide for the Chinese living, studying and working in the UK and a part of their lives. The second is to provide full and objective coverage on China, adhere to the principles of objectiveness and fairness and help the Chinese in the UK to know more about the development and progress, opportunities and challenges and the promising future of China. This would deepen their patriotism and enhance their confidence in China’s development. The third is to facilitate the development of China-UK relations, commit itself to the development of China-UK relations and serve as a bridge for the cooperation between the two countries and the friendship between the two peoples. 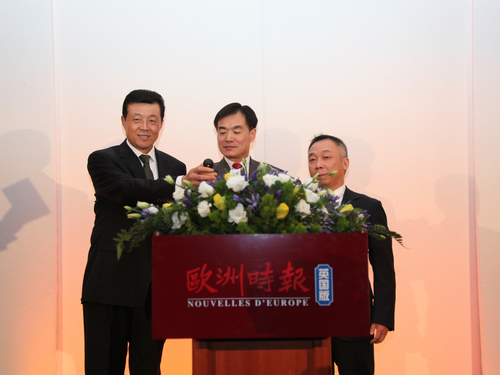 Mr. Zhang Xiaobei, President of the Nouvelles D’Europe, reviewed the growth of the newspaper. He said that they go overseas from Paris to London to publish this UK Edition in the hope to better adapt to the readers in the UK. The UK Edition will enthusiastically serve the Chinese community and will make new efforts in promoting the friendship between the Chinese and British people and the exchanges and cooperation between the two countries in economy, culture and education and other fields, and in promoting Mandarin education and carrying forward the Chinese culture. 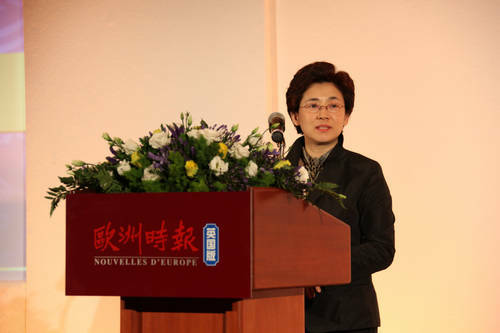 Director Guo Jinling congratulated on the launch of the Nouvelles D’Europe UK Edition. She hoped the newspaper would work with the local media to seek common development and make new contributions to the services for the overseas Chinese and the promotion of the friendship between China and the UK. 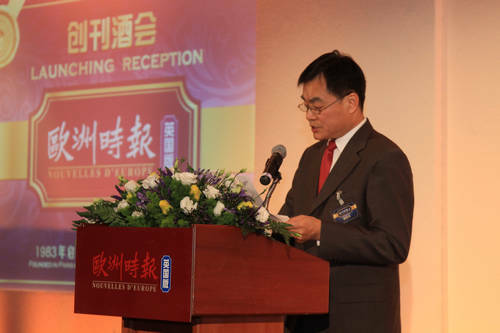 Lord Wei warmly welcomed the launch of the UK Edition. 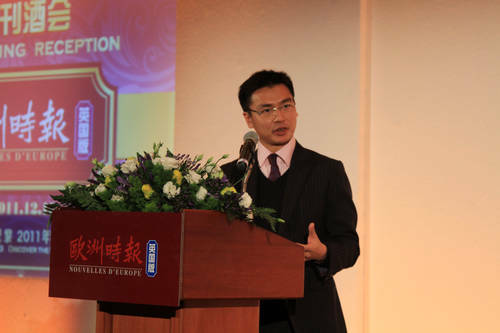 He expected that with its high-quality coverage and comments on the currents affairs in Europe, in the UK and in China, the UK Edition would work with other Chinese newspapers in the UK to become an important bridge serving the Chinese community and strengthening the communication between the general public in the two countries. "I would like to express my sincere congratulations on the launch of the Nouvelles D’Europe UK Edition as a new force in the Chinese media in the UK! I sincerely hope the newspaper will make greater contributions to carrying forward the Chinese culture, reporting what happens in China, serving the overseas Chinese and promoting friendship between China and Europe". Founded in 1983 as the first Chinese language daily newspaper run by the Chinese communities in Europe, the Nouvelles D’Europe is based in Paris and has a distribution network across Europe. It is one of the most influential Chinese-language daily newspapers in Europe.